Do I need a specialist crime fiction editor? Two things have prompted this question. The first was a response from a well-known crime writer I asked to read ‘Cruel Tide’ a few weeks ago. I was pleased that he said some positive things about it, but he ended his note with words to the effect that I needed a specialist editor. I thought about what that implied, but then put it out of my mind in the flurry of activity leading up to publication. The second nudge to my thinking about this question has arrived today. This evening I do my first public outing of the new book,at the library in Ulverston, and I’ve thinking about what to say. Why did I turn to crime fiction after the character-driven trilogy that preceded it? What does crime fiction entail, and what have I learned from this experience? The remark about a specialist editor came back to mind and now I’m thinking harder about it. The role and function of an editor is always tricky for someone like me who’s written a lot over the years and always alone. Many education writers do their work collaboratively, sharing ideas, reading each other’s stuff, getting feedback as they go. I never did. I wrote, read it over a few times, made some adjustments and that was it. Only with the final education book, about school progression for the Canadian market, did I write with others and then have an editor employed by the publishers. I didn’t expect the editor to change much, but she did and all of it for the better, not about the content but in terms of the clarity and economy of expression. I analysed the changes she suggested and learned a great deal about how to write more clearly. The role of editor, it seems to me, is three-fold: first there is ‘content’ editing. For a novel, this is the story edit, that looks at structure and character and chronology, how the whole thing flows and fits together. Then there’s the way that meaning is communicated, the structure of a paragraph or a sentence. Finally there’s the proof read, checking spelling, punctuation, speech marks and so on. All three functions have been undertaken in my books so far by the same person, a friend who has worked in publishing for decades, but almost exclusively with non-fiction. As a reader and book group member she’s analysed my stories in their various iterations, suggested changes, and pointed out anomalies or others mistakes to be ironed out in the final drafts. She would not describe herself as an expert fiction editor and she has – as far as I know – no links with current fiction publishers. I’m hesitating to go back to my crime writer colleague and asks him what a specialist editor could do that my current editor can’t. He’s a busy bloke, and I’ve probably imposed on his time enough already. I did follow up with a phone call to a specialist editor he knows, and during the conversation what became clear was not so much the editing function as the networking that lay behind it. The person I was speaking to was well-connected, to other crime writers, to agents and publishing houses. She lived at the other end of the country and was already very busy, so I took it no further, but I was left still wondering what this editor could do for me. I was back yet again to the issue of genre and the specialised protocols that seem to apply to different genres, and even sub-genres. Obviously a crime writing specialist editor would be more familiar with these protocols than me. She/he would know the insider tricks of the trade that would distinguish my book, and make it more interesting to an agent who would probably also specialise in crime fiction. Editor and agent would have a shared language and recognise my attempts to join that club. The idea of this shared understanding and its unwritten rules is not attractive for me. It plays to my innate and sometimes unhelpful aversion to following rules of any kind that I don’t understand or see the point of. I still ask myself, what do readers really want? Do they get a buzz from seeing how the crime fiction rules are followed in different contexts and with different protagonists. Do they smile in appreciation as they recognise the genre features that they expect as soon as something is described as ‘crime fiction’? Do they only ever look on the crime and mystery shelves of the library or the bookshop? 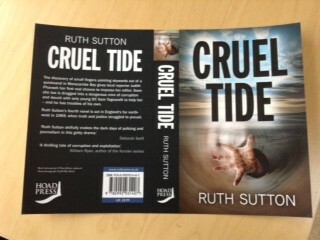 ‘Cruel Tide’ is not classic crime fiction, as far as I can judge. It doesn’t have the closed group of potential suspects, or a single dysfunctional detective with a drink problem, or even a genius problem solver. The story is propelled by the characters as much as by ‘events’. There is no final reveal that ties up loose ends and looks ahead to a certain future. The goodies do not necessarily triumph. What would a specialist editor have made of all this, I wonder? If the advice was to follow the rules of the genre more carefully, how would I react? It’s my story after all. If the editor told me that an agent or a potential publisher would expect me to do things differently, I’m not sure I would have warmed to that advice. I’m too old and too awkward, and I’ve chosen to self-publish with all its attendant risks rather than chase any commercial publishers’ approval. If it doesn’t work, so be it. But still, the notion of a specialist story editor lurks in my head. If I could learn from that interaction, it’s probably something I should do, for myself, but it would have to be someone I respect, and I’d offer no guarantees about my response. Maybe I’ll wait and see the reaction to my first crime novel and go from there. I need feedback, people: specific, considered, detailed feedback and suggestions about alternatives before I embark on the next book in what will probably be a series, although I’m not sure how many more books I want to write. It’s hard work! Aversion to formula, or mere perversity? There’s a book I brought with me on this trip. A real book, not the virtual ones I loaded onto my ipad before I left to save the weight. This real book I want for reference, not for reading: I want to scribble on it, turn pages down, use a leaky highlighter, do all the damaging things we do with real books that makes us possess them and feel part of them. Trouble is I haven’t opened this book yet even though I’ve been away for nearly three weeks and have had plenty of opportunity. I could be reading this book now instead of sitting here writing about why I’m not doing so. Something about this book is putting me off. The book is about writing crime fiction. I bought it because I want to try this genre and my academic upbringing says that you should do research before you start a new project. So I bought the book, to find out how to do it. What am I afraid of? Part of it is that I have an exaggerated aversion to doing as I’m told. If someone says that this is the way to do something I instantly want to do something else. Part of it also is that I read too much crime fiction and recognise the formulas, which I don’t want to replicate. I don’t want to create a middle-aged protagonist with a dysfunctional family and a destructive personality, even though these create fruitful dramas to spice up the narrative and give it ‘depth’. I don’t want to hide ‘clues’ for earnest readers to find, or to divert the same earnest readers from a final chapter revelation. I don’t want to wrap everything up neatly at the end, tied with a ribbon or a rope, a prison cell or a gun. And there’s something else I want to avoid. I don’t want to write about graphic violence, and I would love to avoid any violence against women altogether. Oh, and did I say I would like my crime fiction to win prizes and sell big? If I could stop wittering and read the book on writing crime fiction all these immature assumptions about the genre might be exposed as immature assumptions, and I would be so relieved and inspired that I would start plotting and planning immediately. Or not. Maybe, seriously, I should think first and then read how it’s supposed to be. Reading the book might be easier, but I think I need to let this ‘cognitive dissonance’ fester for a little longer. That’s what I think right now. By next week I may have changed my mind. That’s what comes of being perverse. Highsmith: of course. I need to read Highsmith. Any other genre-busting suggestions?